"Infrared sensor" redirects here. For other kinds of infrared sensors, see Passive infrared sensor, Infrared point sensor, and Nondispersive infrared sensor. Infrared was discovered in 1800 by Sir William Herschel as a form of radiation beyond red light. These "infrared rays" (infra is the Latin prefix for "below") were used mainly for thermal measurement. There are four basic laws of IR radiation: Kirchhoff's law of thermal radiation, Stefan-Boltzmann law, Planck’s law, and Wien’s displacement law. The development of detectors was mainly focused on the use of thermometer and bolometers until World War I. A significant step in the development of detectors occurred in 1829, when Leopoldo Nobili, using the Seebeck effect, created the first known thermocouple, fabricating an improved thermometer, a crude thermopile. He described this instrument to Macedonio Melloni. Initially, they jointly developed a greatly improved instrument. Subsequently, Melloni worked alone, developing an instrument in 1833 (a multielement thermopile) that could detect a person 10 meters away. The next significant step in improving detectors was the bolometer, invented in 1880 by Samuel Pierpont Langley. Langley and his assistant Charles Greeley Abbot continued to make improvements in this instrument. By 1901, it had the capability to detect radiation from a cow from 400 meters away, and was sensitive to differences in temperature of one hundred thousandths of a degree Celsius. The first commercial thermal imaging camera was sold in 1965 for high voltage power line inspections. In 1929, Hungarian physicist Kálmán Tihanyi invented the infrared-sensitive (night vision) electronic television camera for anti-aircraft defense in Britain. The first thermographic cameras developed were infrared line scanners. This was created by the US military and Texas Instruments in 1947[not in citation given] and took one hour to produce a single image. While several approaches were investigated to improve the speed and accuracy of the technology, one of the most crucial factors dealt with scanning an image, which the AGA company was able to commercialize using a cooled photoconductor. The first infrared linescan system was the British Yellow Duckling of the mid-1950s. This used a continuously rotating mirror and detector, with Y axis scanning by the motion of the carrier aircraft. Although unsuccessful in its intended application of submarine tracking by wake detection, it was applied to land-based surveillance and became the foundation of military IR linescan. This work was further developed at the Royal Signals and Radar Establishment in the UK when they discovered mercury cadmium telluride could be used as a conductor that required much less cooling. Honeywell in the United States also developed arrays of detectors which could cool at a lower temperature, but they scanned mechanically. This method had several disadvantages which could be overcome using an electronic scanning system. In 1969 Michael Francis Tompsett at English Electric Valve Company in the UK patented a camera which scanned pyro-electronically and which reached a high level of performance after several other breakthroughs throughout the 1970s. Tompsett also proposed an idea for solid-state thermal-imaging arrays, which eventually led to modern hybridized single-crystal-slice imaging devices. One of the most important areas of development for security systems was for the ability to intelligently evaluate a signal, as well as warning of a threat's presence. Under the encouragement of the United States Strategic Defense Initiative, "smart sensors" began to appear. These are sensors that could integrate sensing, signal extraction, processing, and comprehension. There are two main types of Smart Sensors. One, similar to what is called a "vision chip" when used in the visible range, allow for preprocessing using Smart Sensing techniques due to the increase in growth of integrated microcircuitry. The other technology is more oriented to a specific use and fulfills its preprocessing goal through its design and structure. Towards the end of the 1990s, the use of infrared was moving towards civil use. There was a dramatic lowering of costs for uncooled arrays, which along with the large increase in developments lead to a dual way use market between civil and military. These uses include environmental control, building/art analysis, medical functional diagnostics, and car guidance and collision avoidance systems. Infrared energy is just one part of the electromagnetic spectrum, which encompasses radiation from gamma rays, x-rays, ultra violet, a thin region of visible light, infrared, terahertz waves, microwaves, and radio waves. These are all related and differentiated in the length of their wave (wavelength). All objects emit a certain amount of black body radiation as a function of their temperature. A major difference with optical cameras is that the focusing lenses cannot be made of glass, as glass blocks long-wave infrared light. Typically the spectral range of thermal radiation is from 7 to 14 μm. Special materials such as Germanium, calcium fluoride, crystalline silicon or newly developed special type of chalcogenide glasses must be used. Except for calcium fluoride all these materials are quite hard and have high refractive index (for germanium n=4) which leads to very high Fresnel reflection from uncoated surfaces (up to more than 30%). For this reason most of the lenses for thermal cameras have antireflective coatings. The higher cost of these special lenses is one reason why thermographic cameras are more costly. For use in temperature measurement the brightest (warmest) parts of the image are customarily colored white, intermediate temperatures reds and yellows, and the dimmest (coolest) parts black. A scale should be shown next to a false color image to relate colors to temperatures. Their resolution is considerably lower than that of optical cameras, mostly only 160 x 120 or 320 x 240 pixels, although more expensive cameras can achieve a resolution of 1280 x 1024 pixels. Thermographic cameras are much more expensive than their visible-spectrum counterparts, though low-performance add-on thermal cameras for smartphones became available for hundreds of dollars in 2014. Higher-end models are often deemed as dual-use and export-restricted, particularly if the resolution is 640 x 480 or greater, unless the refresh rate is 9 Hz or less. The export of thermal cameras is regulated by International Traffic in Arms Regulations. Infrared photodetectors can be created with structures of high bandgap semiconductors such as in Quantum well infrared photodetectors. In principle, superconducting tunneling junction devices could be used as infrared sensors because of their very narrow gap. Small arrays have been demonstrated. They have not been broadly adopted for use because their high sensitivity requires careful shielding from the background radiation. Uncooled infrared sensors can be stabilized to an operating temperature to reduce image noise, but they are not cooled to low temperatures and do not require bulky, expensive, energy consuming cryogenic coolers. This makes infrared cameras smaller and less costly. However, their resolution and image quality tend to be lower than cooled detectors. This is due to differences in their fabrication processes, limited by currently available technology. An uncooled thermal camera also needs to deal with its own heat signature. Current improvements of uncooled focal plane arrays (UFPA) are focused primarily on higher sensitivity and pixel density. In 2013 DARPA announced a five-micron LWIR camera that uses a 1280 x 720 focal plane array (FPA). Some of the materials used for the sensor arrays are amorphous silicon (a-Si), vanadium(V) oxide (VOx), lanthanum barium manganite (LBMO), lead zirconate titanate (PZT), lanthanum doped lead zirconate titanate (PLZT), lead scandium tantalate (PST), lead lanthanum titanate (PLT), lead titanate (PT), lead zinc niobate (PZN), lead strontium titanate (PSrT), barium strontium titanate (BST), barium titanate (BT), antimony sulfoiodide (SbSI), and polyvinylidene difluoride (PVDF). Originally developed for military use during the Korean War, thermographic cameras have slowly migrated into other fields as varied as medicine and archeology. More recently, the lowering of prices has helped fuel the adoption of infrared viewing technology. Advanced optics and sophisticated software interfaces continue to enhance the versatility of IR cameras. Viewed from space by WISE using a thermal camera, asteroid 2010 AB78 appears redder than the background stars as it emits most of its light at longer infrared wavelengths. In visible light and near-infrared it is very faint and difficult to see. Astronomy, in telescopes such as UKIRT, the Spitzer Space Telescope, WISE and the James Webb Space Telescope (currently under construction). Some specification parameters of an infrared camera system are number of pixels, frame rate, Responsivity, noise-equivalent power, noise-equivalent temperature difference (NETD), spectral band, distance-to-spot ratio (D:S), minimum focus distance, sensor lifetime, minimum resolvable temperature difference (MRTD), field of view, dynamic range, input power, and mass and volume. ^ Barr, E. S. (1962). The infrared pioneers—II. Macedonio Melloni. Infrared Physics, 2(2), 67-74. ^ Langley, S. P. (1880). "The bolometer". Proceedings of The American Metrological Society. 2: 184–190. ^ Barr, E. S. (1962). The infrared pioneers—III. Samuel Pierpoint Langley. Infrared Physics, 3 195-206. ^ Naughton, Russell (10 August 2004). "Kalman Tihanyi (1897–1947)". Monash University. Archived from the original on 24 October 2003. Retrieved 15 March 2013. ^ Gibson, Chris (2015). Nimrod's Genesis. Hikoki Publications. pp. 25–26. ISBN 978-190210947-3. ^ "Infrared Technology". 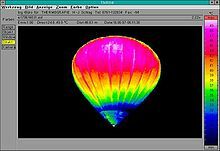 thermalscope.com. Archived from the original on 8 November 2014. Retrieved 1 November 2014. ^ "Thermal detector with preferentially-ordered thermally sensitive element and method - Raytheon Company". freepatentsonline.com. ^ "Thermal imaging highlights Westminster's energy waste". IRT Surveys. 19 February 2013. Retrieved 15 March 2013. ^ "Thermal Imaging Application Overview". Bullard. Archived from the original on 16 September 2008. Retrieved 15 March 2013.